Clad-Wood: Low-maintenance exterior metal cladding is like a coat of armor for extra protection from the elements. These patio doors feature beautiful wood inside your home with protective metal cladding outside. The baked-on finish is durable, easy to care for and available in a variety of popular colors. Wood: With wood patio doors, you'll get the beauty of natural wood interiors and exteriors without the worry of termites, wood rot and water saturation. Made with our exclusive solid Pine AuraLast® Wood, these patio doors are easy to care for while offering design freedom to stain, clear coat or paint to get the exact look you want. Vinyl: Vinyl is recognized for being remarkably durable and secure to give you years of steadfast performance. These patio doors are easy to care for and reliable with JELD-WEN’s lifetime glass breakage coverage available. There are also ample design options to boost your home's character. Aluminum: These patio doors are lightweight and strong, and are most frequently selected for homes in warmer, milder climates where heat loss is not as much of a concern. Aluminum patio doors are also noted for being cost-effective. Door configuration: Choose from two, three or four panels to create a grand opening. Glass options: The glass you select for your sliding doors can add both style and performance benefits. You can choose from performance features like impact-resistant glass for storm concerns, or Low-E glass to improve energy efficiency and provide UV protection. Style features include textured glass for added functionality and privacy concerns. Many homeowners also appreciate the ease of use and low maintenance features of Blinds Between the Glass. Tempered glass is also standard and available in all glass types and provides extra strength, enabling it to withstand force or pressure on its surface and not break into sharp pieces. Fiberglass: Fiberglass patio doors offer the look of real wood, but with less upkeep. Fiberglass requires minimal maintenance and is built to withstand any climate – hot or cold, wet or dry. Door configuration: Choose a single glass door, or a double glass door, commonly known as French doors, to create a grand entrance with twice the opening space. Add a sidelight or two to give the illusion of a larger entry. Door swing: Glass doors are available as inswing (I/S) or outswing (O/S) models. 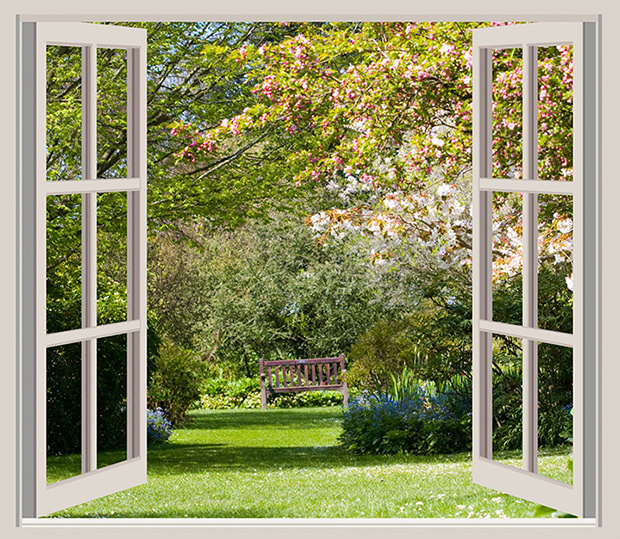 This simply refers to the direction your glass door will swing: outward (toward the outside of the house) or inward (toward the inside). Most homes are built to accommodate inswing doors; however, your door can be designed to swing outward if preferred. Grilles: Grilles (also called grids) are the decorative pieces that divide the glass into panes, commonly seen in French door styles. Many homeowners include grilles with their swinging glass doors to accent the architecture of their home. Glass options: The glass you select for your patio doors can add both style and performance benefits. You can choose from performance features like impact-resistant glass for storm concerns, or Low-E glass to improve energy efficiency and provide UV protection. Style features include decorative glass or textured glass for added functionality and privacy concerns. Many homeowners also appreciate the ease of use and low-maintenance features of Blinds Between the Glass. Tempered glass is also standard and available in all glass types and provides extra strength, enabling it to withstand force or pressure on its surface and not break into sharp pieces. Usually you can jsut replace the lock and handle. Before you do this, make sure that the connection on the frame is in the good position, sometimes that gets a little loose and slides, which can cause the latch on the door itself to fail to hook in and/or unhook. No point in replacing hardware when it isn't the problem. Either way, it is a relatively easy job, even for an amateur like me (and apparentyl you too). Safety Locks for Sliding Glass Doors? When my children were young, they were little escape artists. They actually snuck outside at 3 & 4 to play barefoot in the snow; I found out the next morning -footprint evidence. This excursion was before home alarm systems were standard. I found sliding door screw clips at the hardware store. If you cannot find the clips it would be simple to drill a small hole in the upper track of the sliding glass door and slip a small nail in the track. The GMC Terracross was an all-wheel-drive concept SUV made by General Motors in 2001. Although it had the appearance of a futuristic compact SUV, the Terracross also had the characteristics of a convertible and a pickup truck. Zeta is a marque of automobile which was produced in Australia from 1963 to 1965 by South Australian manufacturing company Lightburn and Co.
@R0MELLE: what initially appeared to be the iron gates of Hell, actually turned out to be the sliding glass doors of The Home Depot.